Anders @ Work: SkyDrive - Wow! I didn't use Windows Live Spaces as source for my blog because I missed the ability to have more than one blog. But Live Spaces have other great things and it is evolving all the time. 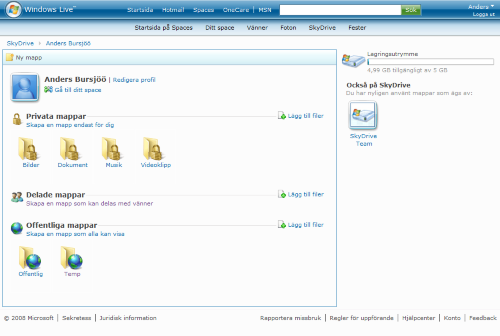 The latest thing it Live SkyDrive which is a web based storage space for files. You can have your private folders, share folders with a set of friend or you can have public folders. The storage area is 5 GB (!) and it is free. All you need is to register for Live Spaces (which is piece of cake if you have a Hotmail-account). "...which is piece of cake if you have a Hotmail-account..."